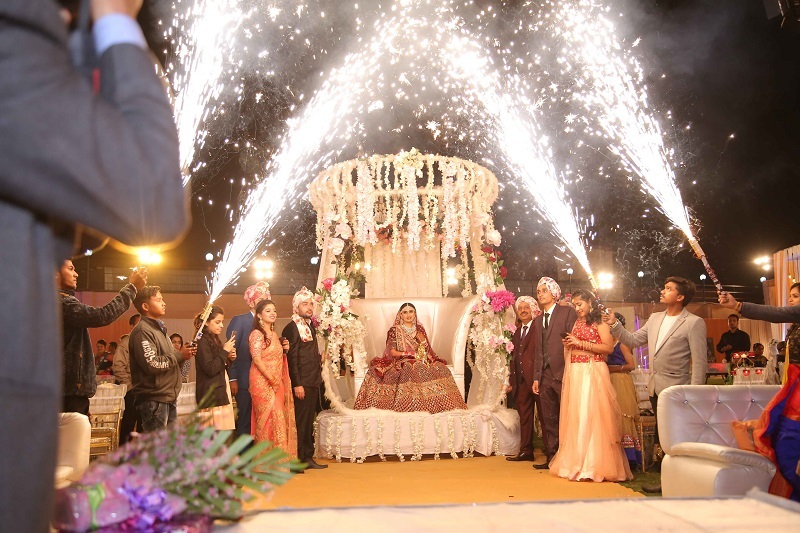 Check out the detailed planning that went on in Shivali and Shrey’s wedding in Kota Rajasthan. Images by Lovers Films Wedding Photography. We met 10 years ago during our undergraduate studies and from the very early days of first year of college till date we have been the best of friends and more to each other. After late night calls and daily interaction, we graduated from friendship to love on his Birthday 31st may 2010. There was no formal proposal. We just knew it would come to this! This took place approx. one year before i.e. on 15th February 2017. It was a day event at Radisson Blu Marina Hotel Connaught Place, Delhi followed by lunch. It was a small gathering of approx.. 30 family members. Sangeet night had a theme of green and blue colours.We all danced like never before.Shrey’s sister in law used Kajal and other products to make him more dapper. The theme of sunflowers and yellow dominating colors at the bride’s side was more like celebrating Holi with Haldi and flowers. The entire family danced on the beats of dhol as a Punjabi celebration without dhols is incomplete! Groom’s entry was traditional, on the ghodi, with endless dance and never ending baraat masti. This was followed by Vidai (at this point I was the happiest bride in the world as I finally got an opportunity to change out of my heavy wedding dress)! The decor theme was complete with white flowers in a Rajasthani fashion and after my grand musical entry the varmala took place on stage amidst flowers petal rain and crackers thundering in the sky above us! 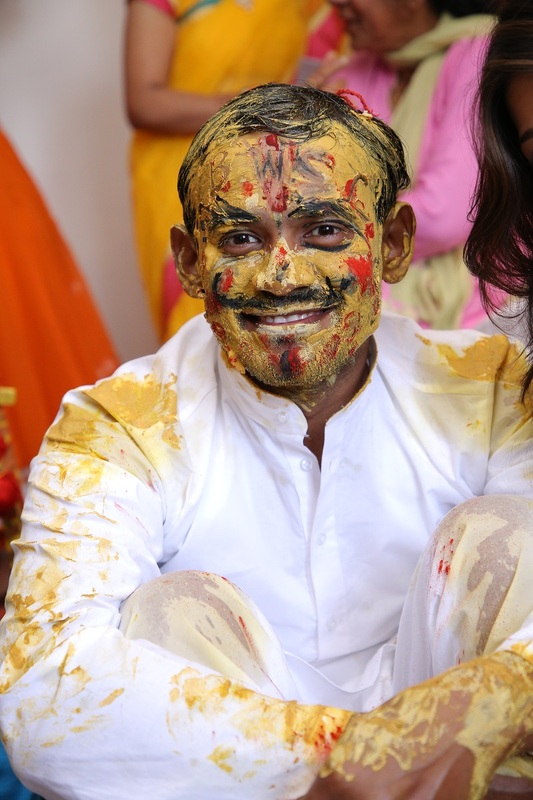 The haldi was an amalgamation of fun & emotions. Huge variety of Traditional Rajsthani lunch complete with Dal batti, Bafla, kath etc. The mehendi was clubbed with groom’s side function. My bridesmaids (my cousins and friends) did a fantastic job during the mehndi function and they helped me out in everything from eating to getting ready. 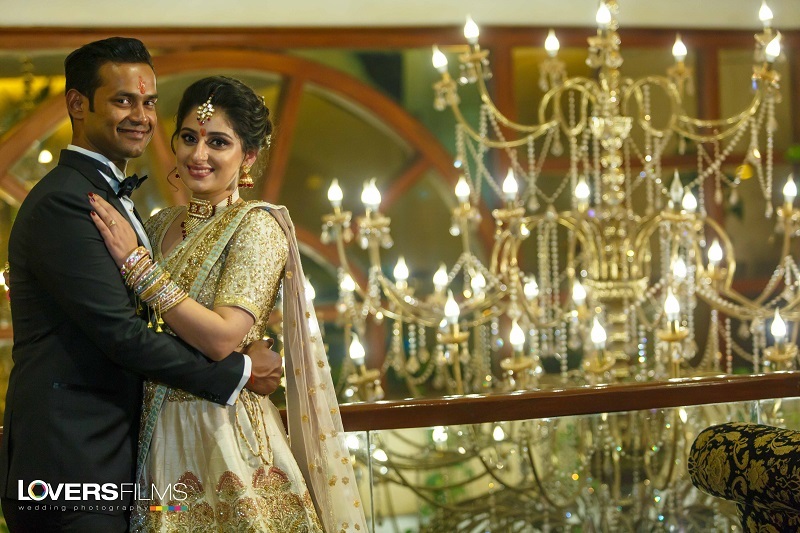 Engagement ceremony – My Dress: Pastel color Lehenga tailored by Omprakash Jawaharlal, Chandani Chowk (Delhi), Groom’s Dress: Black colored traditional tuxedo tailored by Raymond(Delhi). Mehndi Function– My Dress: Pink & Orange Color Crop Top (off shoulder) Dress, Groom dress: white color Kurta with Grey color Modi jacket. Sangeet Night– My Dress: Pastel color(Mint Green) dress tailored by Omprakash Jawaharlal, Chandani Chowk Groom’s dress: Blue traditional suit tailored by Raymond(Delhi). Wedding (22nd January 2018 evening- My Dress: Maroon Color Lehenga tailored by Asiana Couture paired with Light Pink Dupatta, Groom’s dress: shervani tailored by Manyavar, Rajasthan. I went with makeup artist Sakshi Sood .Having gone through the work of hundreds of makeup artists on Instagram, I definitely wanted someone known for her impeccable and flawless work. 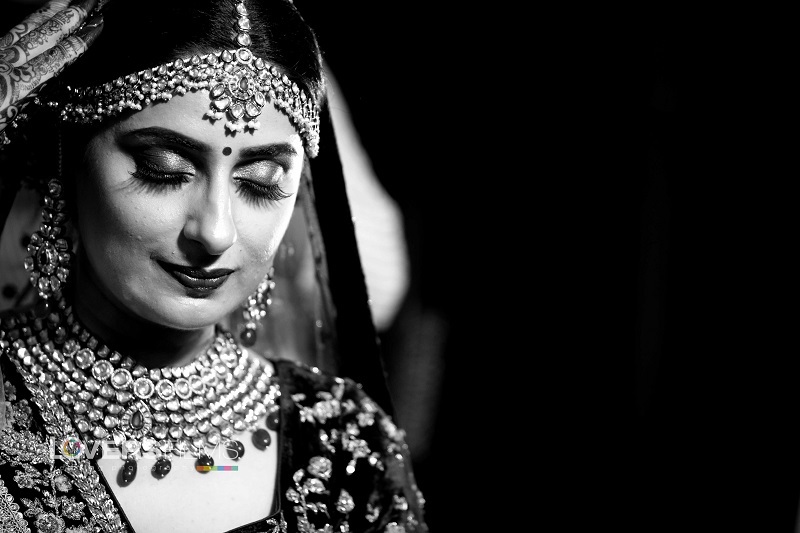 I am so glad I chose Sakshi-she delivered beyond my expectations and made me look like the royal Indian bride. The makeup for all events was different & long lasting. Hair Stylist – Reena(Reena makeup Artist) in collaboration with Sakshi Sood. She was super quick and efficient; she really did a great job. Lovers Films Photography & Cinematography. They managed all our events across 2 different cities and were excellent in capturing candid moments rather than focusing on posed shots. The team managed to capture so many beautiful moments between friends and family. 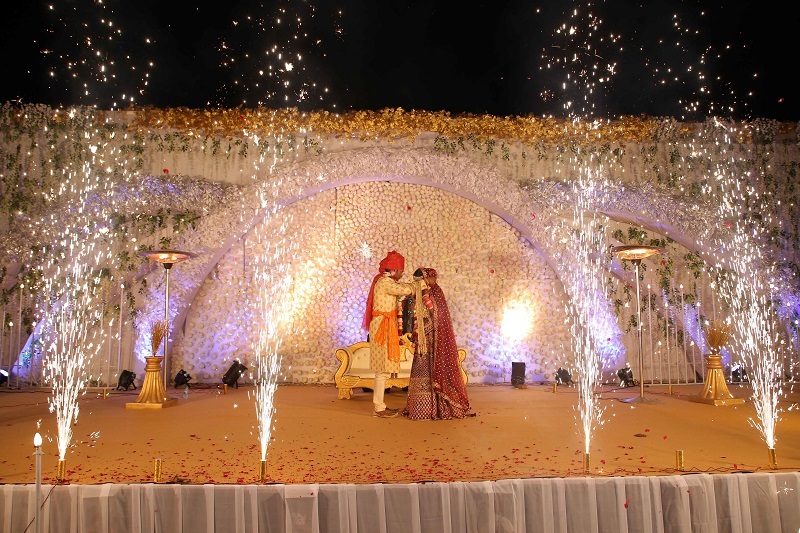 S R Balaji Events.They made our wedding a seamless event and truly understood our vision . The team converted our fantasy and vision into reality! 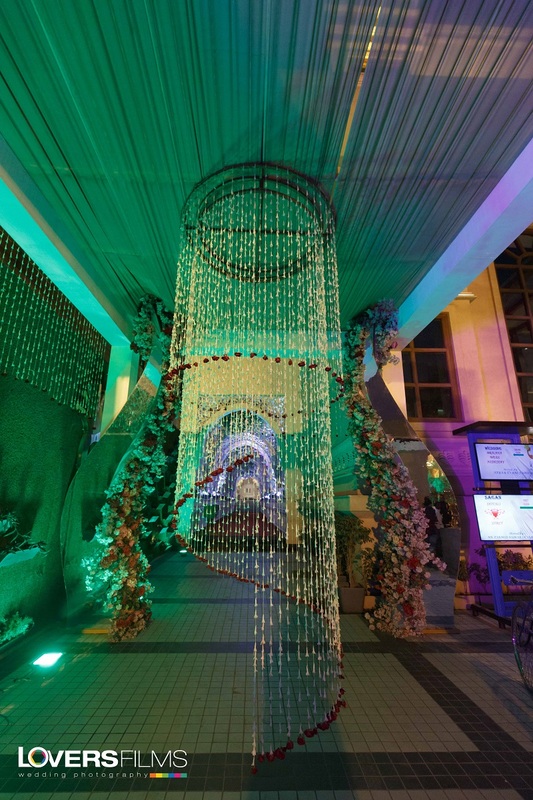 Cherish Banquets, Delhi for engagement & Hotel 5 Flowers, Kota (Rajasthan) for wedding. Both were amazing venues with excellent culture of hospitality to offer the best comfort to guests. It was a major requirement for us that both venues should be well connected to the city. 5 Flowers had beautiful and cozy rooms, party halls, swimming pool and a large garden area for our wedding. It was hands down the Sangeet night! We had loads of great performances. Everyone joined in-including my mother in law and my siblings. There were brilliant individual performance from the groom’s brother and sister in law as well. Shrey and I also had a performance which was the show stopper that rounded off the great night! It’s so much fun-just relax, enjoy and cherish every moment!! !